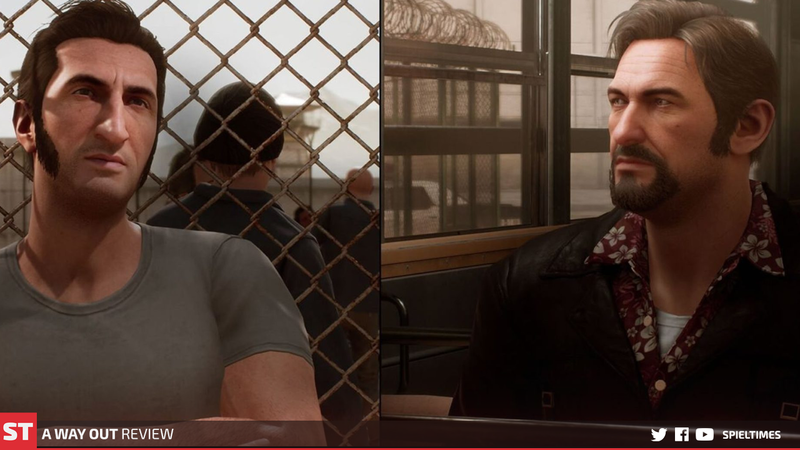 Despite all its flaws, A Way Out lives on as one of the most amusing games I've experienced till date. With the internet now at everyone’s doorsteps, there is a noticeable fall in the ratio of single players and multiplayers. At one point in time, there was a craze over buying trendy singleplayer games. People would wait in queues outside retail stores to purchase the latest stock of DVDs which had arrived on the shelves, sometimes to flaunt their purchasing power and at other times just to be pretentious about owning something that someone else wanted badly. But in the contemporary time, the introduction of high-speed internet has facilitated the increase in the number of games fashioned to be played with strangers from around the globe as well as the mediums of distribution. I can’t remember the last time I went out of my room to buy a game. There is no need for that when there are platforms which offer games at half the price and offer discounts reguarly. All this is possible thanks to the internet. So while people go around crying about how bad it is, we cannot refuse to believe in reality, that the internet is responsible for the creation of portals which have made things much easier for us. So, games that eventually started out with the 2 players feature like in Mario and FIFA, made to be played with friends on the same system was later transcended by multiplayers and co-ops played from different systems by different individuals from different corners of the world. There wasn’t an outcry for a return of the old features what so ever. But it seems that a group of arduous developers from Sweden were firm with their stance and decided to do things differently. Hazelight Studios is the emergent indie team which is responsible for the subject of today’s discussion. Their game has created such an impact both in choreography and style that reputed publisher EA readily agreed on stamping their trademark on the cover image. We know from experience that trying to do something that has no demand in the market is indeed a risky enterprise but the efforts put into building the game was not altogether a quest for an imaginary relic. Instead, it bore the fruits of labour. Let’s talk about it in further details as we dive into the world of A Way Out. 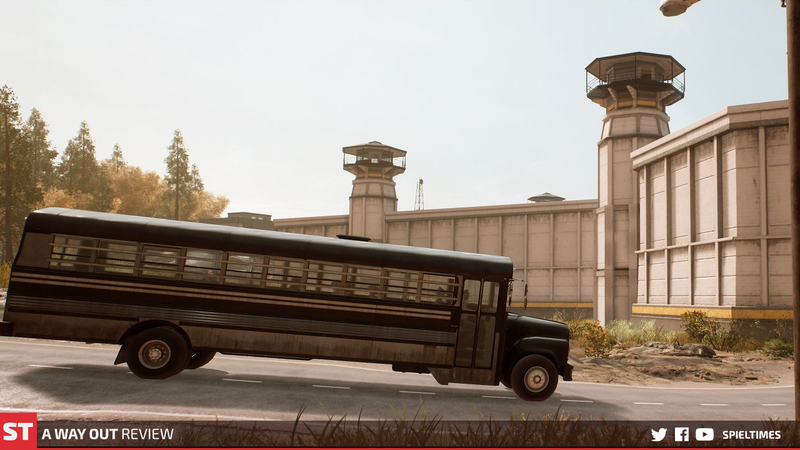 WHAT IS A WAY OUT ABOUT? Leo Caruso is apprehended for Grand Theft Auto and is sentenced to eight years of prison, out of which he has already spent six months. One day a fresh inmate by the name of Vincent Morrety arrives in the same prison. At the same time, a crime boss named Harvey, who is responsible for Leo’s arrest, after he betrayed him in over an illegal diamond smuggling deal, has hired a group of inmates to eliminate Leo. When Leo is attacked by the assailants, Vincent steps in and helps him put them down. Quite a few days later they are struck once again by the same inmates but they manage to narrowly escape death as the guards intervene and stop the attackers. These encounters play a crucial role in creating a bond between the two characters. Later on, they find out that both of them are in prison because of the same person. Leo learns that someone very close to Vincent was killed by Harvey. Discovering that the two of them had similar interests (to go in pursuit of Harvey for revenge), they conceive a plan to break out of jail. Their subsequent adventures bring them very close to one another as they declare themselves partners in arms who are on a journey to take revenge. If there is any game that could get anywhere close to a Hollywood movie, it is this without a doubt this. 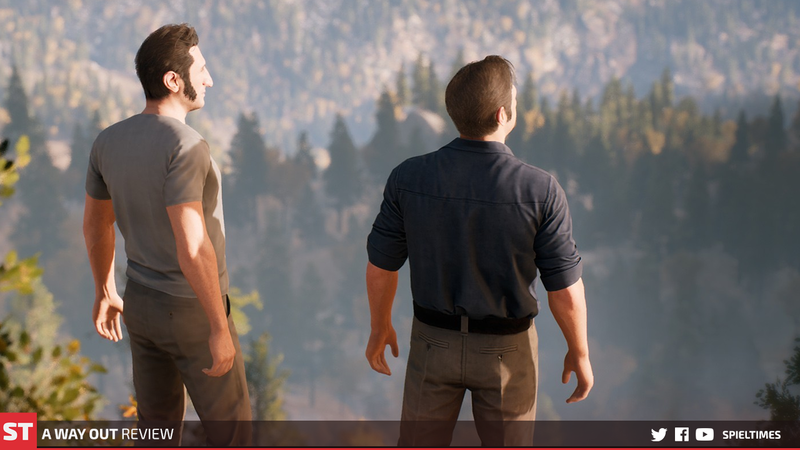 A Way Out is a unique game in terms of choreography and real-time animation. But I would have liked it more if the in-game animations were perfected to a degree. The walking and the running felt kind of clunky, and since we are talking about an interactive game centered around an interchangeable narrative that is not as gameplay intensive as one would expect it to be, I think it is fair to bring this matter up. The turn radius and duration of the characters is ridiculous. It would have been much better if it felt more ‘real’, like something that you will find in Mafia 2; there, turning the character around feels more natural and is followed by a smooth swivel as opposed to a rough spin of the entire model. There was a sequence where you can play a game of basketball with Leo’s son(there are several such mini games throughout the game and most of them are just there to make the environment interactive, or atleast make it appear so), and although it is a mini-game that would not affect the main story, it felt really uninteresting. In some places the ball simply seemed to have clipped on to the hand, as if attracted by a magnet. With every game there comes a limit to how much you can fit into it. While assessing A Way Out, we must keep in mind that every game studio and the person in-charge of directing it has their own take on. In this case, the man in-charge of direction is a prominent Swedish movie developer who quit the industry to become a video game developer. Josef Fares’s visions were far from making just a video game. He wanted it to look and play like something from a movie, with a lot of blood-pumping action and thrilling adventure, supplemented with a crisp clean narrative. But alas! It fails even in doing so, as the players are met with yet another predictable twist at the end, which I will be elaborating at the very end of this section. As I said before, there is very little to gameplay, other than walking around and exploring and exchanging words with other NPCs, which I am sad to say, is pretty useless as there is very little exploration value at all. There are no rewards or risk rewards what-so-ever. And although there are different choices you can adopt, it does not really affect the ending at all. However, the emphasis on teamwork is appreciable, i.e., it requires a ton of co-operation and communication with your partner even to get the simplest job done. The real-time rendered cutscenes are flawless and with a certain stroke of choreographic mastery it cries perfection in the face of some of the best action games and even movies that the world has seen. The action sequences are very well orchestrated and the cinematography is top notch. I expect nothing less from a movie director. One of my personal favourites is the Hospital Escape level(can’t recall what the mission was called but I guess that ought to work). It stands, perhaps as one of the finest scenes in the entire game. The way transitions were made from one character to another and how the control switched over from me to my partner(Pratyush) all just in the same mission and that too as we played from our own homes was amazing. We were quite impressed by that and continued to bring that up throughout the game. Apart from that I also enjoyed the parts which involved driving. Those are the bits that make it a lot more diverse by eliminating the repetitive environment generated by all the boring button-mashing combat and the nugatory exploration/progression. But honestly though, off-roading and switching lanes randomly as the cops chase you and letting your partner shoot them down, even though it sounds cliché by movie standards, played out pretty well. A little secret, Pratyush is awful in driving. I had to play through the last part where you have escape Harvey’s lair on motorcycles atleast 30 times. Poor guy kept losing his way and crashing into the sides of the map. It was hysterical, and I should confirm that I was entertained through out the playthough. We kept pulling each other’s legs, making occasional puns and joking about the characters. It was well worth our time for sure. I have mentioned quite a few flaws this game has above in a rather haphazard manner but one of the biggest put-offs was, as I discovered, the script. I don’t know if it’s just me, but some of the scenes felt extremely cheesy and awkward. They could have been more creative with the dialogues as well. As I mentioned before, there are character based approaches in certain parts(while Leo’s approach is more aggressive, Vincent’s approach is more rational), which I am yet again sad to say, only governs the progression on a short term and does not really affect the end of the game. And then ofcourse, there is the easily predictable ending, ***spoiler alert*** the inevitable face-off between the two players(you and your partner). And that is the only time I absolutely hated the split screen feature. If you get to see where your partner is hiding and calculate his moves just by looking at the other side of the screen the confrontation loses its point. It should be such that the most skilled player gets to end the story the way he wants to. And whether you like it or not, that is where the bond breaks, that is, one of the characters has to die. Particularly, interactive games like this lack a lot of gameplay component, which is why I am not really fond of them. It nullifies the purpose of a game. A game, I believe, is meant to be played and not simply to push buttons and execute minor actions and watch them being performed. There was a serious lack of gameplay. The plot was cliché, there were cheesy dialogues, a genuine absence of alternative progression which branches the story and a multiple ending scenario. 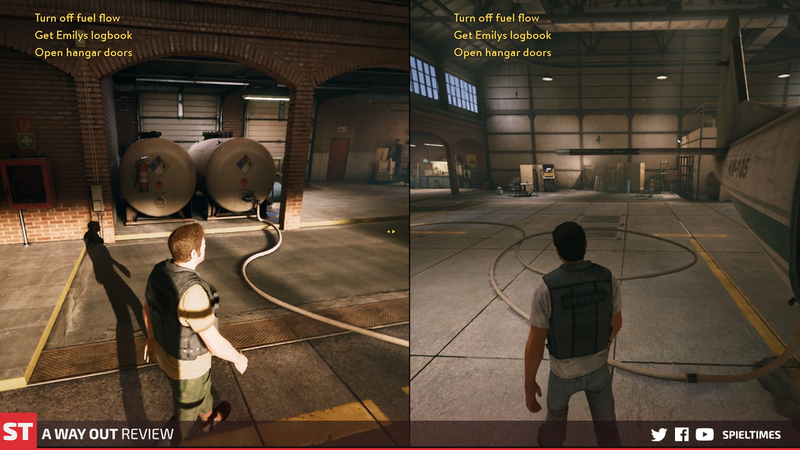 Despite all its flaws, A Way Out lives on as one of the most amusing games I’ve experienced till date. Playing with a buddy helps minimize boredom and while you are at it you can just joke around with the absurdities that the game puts before you or just chat casually like old friends do. The skillful choreographies will keep your eyes riveted to the screen and the action sequences will no doubt win you over. All in all, it offers quality experience and definitely has replay value for those who like to go back and try alternative character approaches. A Way Out is priced at Rs. 1,999 on Origin. 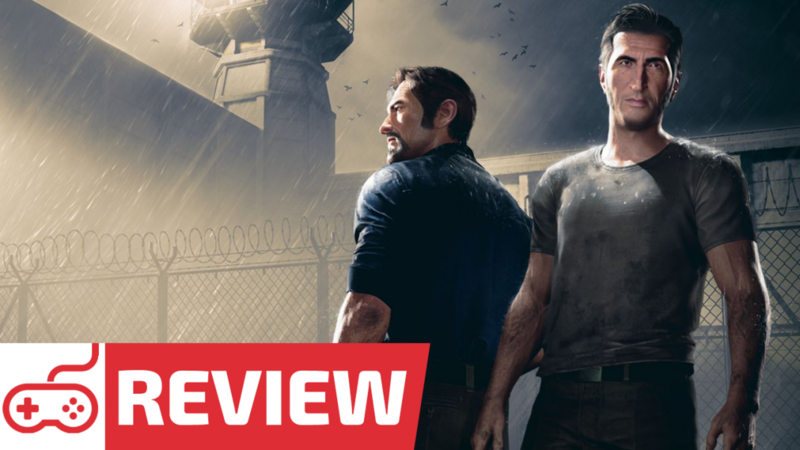 What do you think about our review on A Way Out? Do you think this game is worth it for the price? Let us know in the comments below. Make sure you subscribe to our push-notifications and never miss an update on A Way Out. Until next time, Happy Gaming!